One of my colleagues is celebrating her birthday soon and I gave her a black forest cake last year. This year since there are plenty of strawberries in the supermarket and they are rather sweet and good so I have decided to make her a strawberry cake. I hope she will like it. Happy Birthday W (I know I am a bit early in giving you the cake). But nevermind lah, it's the thoughts that count! I am sure your colleague will love it. Would you mind sharing this nice recipes with us. Hi Mixue, actually very easy. Make a spongecake (recipe in my blog). Then slice the cake into two or three layers. 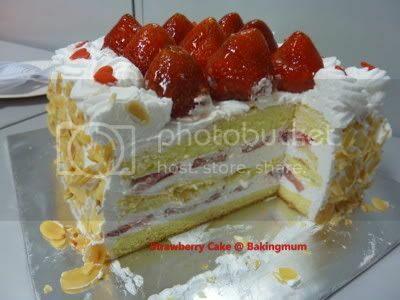 Put on a cake board, apply some whipping cream (non-diary whipping cream or topping cream) put strawberry slices and top with some more whipped cream. Put another layer of sponge on top. If using three layers, then repeat step one. 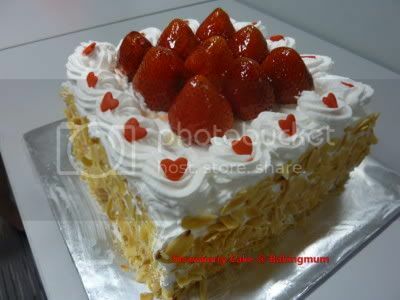 Then just apply whipped cream all over the cake and smoothen it and decorate with strawberry or other fruits of your choice. What I nice cake? Your friend must be very happy to receive this cake as a birthday present. How much whipping cream did you use for the whole cake and how big is the cake? Like to make one for a family member's birthday in august. I love the extra touch of adding the heart shape decorative thingy, made it extra sweet. Very pretty cake! The colour is amazing! You decorated it very nice! Kim, I didn't measure the whipping cream when I poured it into the bowl. I roughly estimate should be around 300g or thereabout. The cake is a 8in sponge but I cut a bit of the four sides away. Hugbear, it is so bless to b ur fren ler! i want to b ur fren! hahaha! i want the cake! hahaha! i llike the this cake very much! very beautiful! could i check what's the brand of the cream that you use? how long can it stay at room temperature? WY, I used the Topping Cream from Phoon Huat. It can last for quite a few hours at room temp. i c i c. thanks!!! I have passed the Kreativ Blogger Award to you. Happy Baking! Did u dip the strawberries in gelatin? Is it just gelatin or with sugar? Hope u can let me know. Can share the cream recipe? And do you know if i want to whip a cream? Can i use the mixer i've at home which i always use to beat butter/eggs? Kris, it is just plain topping cream (non-diary whipping cream). Just pour into your mixing bowl and whipped it up. Yes use the whisk type to beat up the cream. Jassy, I dissolved some glazing gel with water and apply over the strawberries. Thanks Hugbear, can I buy glazing gel from Phoon Huat? i love how the hearts compliment the colours of the cake! these strawberry chiffon shortcakes are my favourite! Yes, you can get the glazing gel from Phoon Huat. You're really helpful in answering all our question. I bought the glazing gel from Phoon Huat but is it possible to tell me what is the water/gel ratio? Much appreciated! Jassy, the ratio is 1:1. You need to work fast because as soon as the glazing gel cools down, it becomes hard again. If it happens, just put it over doubleboil to melt it down or microwave it a bit to melt down.